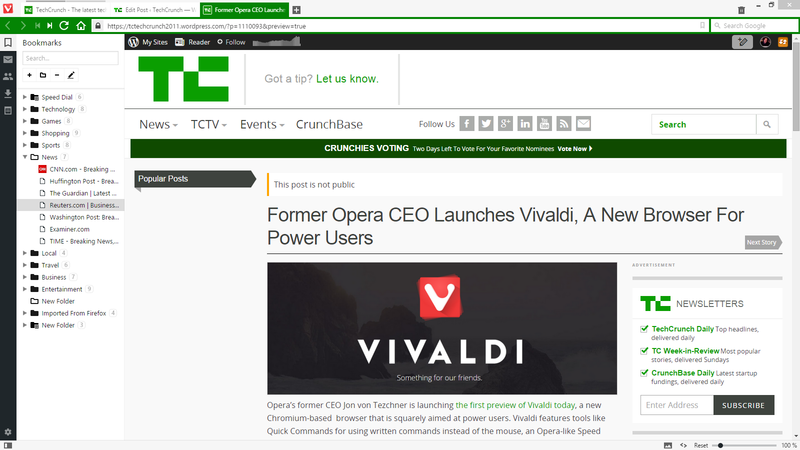 Opera’s former CEO Jon von Tetzchner is launching the first preview of Vivaldi today, a new Chromium-based browser that is squarely aimed at power users. Vivaldi features tools like Quick Commands for using written commands instead of the mouse, an Opera-like Speed Dial for quickly accessing bookmarks, a note-taking feature and the ability to organize tabs into stacks. It’s been three-and-a-half years since the outspoken von Tetzchner resigned as Opera’s CEO after co-founding the company back in 1995. He reappeared almost exactly a year ago when he launched Vivaldi — a social network and forum site for exiles from Opera’s now-closed community site. It was always pretty clear that von Tetzchner had larger ambitions than running a forum, though. The team has worked on the Vivaldi browser for the last year-and-a-half, and while this is clearly still an early preview and many features are still missing, the browser feels pretty polished already. Many of Vivaldi’s features were clearly inspired by Opera, and von Tetzchner freely acknowledges that — but then Opera decided to do away with many of these after it made the switch to WebKit (and later Blink). “There are a lot of browsers available for the crowd that doesn’t want a lot from their browsers,” von Tetzchner argued. “We are going for the kind of user who spends a lot of time online, keeps a lot of tabs open and likes to work efficiently with a lot of content. The Vivaldi team decided to go with Chromium as the foundation of the browser. The team was obviously too small to write its own engine from scratch, and while von Tetzchner also looked at using Mozilla’s engine and WebKit, he decided to go with Google’s project in the end. I’ve used the preview of Vivaldi as my main browser for a full day now and the team is definitely on the right track. The design emphasizes simplicity, but there are also a few playful touches. The tabs and menus change color according to the dominant color in a site’s favicon, for example (you can turn this off, too). Like earlier versions of Opera, Vivaldi puts a menu strip in the left corner of the window to allow you easy access to your bookmarks and other browser tools. There are lots of nifty little features already built in, including tab previews and the ability to move tabs to any corner of the browser window. 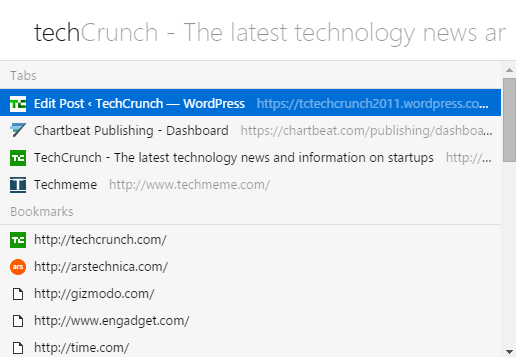 At first, I thought the Quick Commands tools (which works a bit like Apple’s Spotlight) wouldn’t be all that useful, but once you start using this feature, it quickly becomes part of your routine, and I actually missed it when I went back to Chrome. It’s still missing a couple of features I need for everyday use, though. There is no bookmarks bar yet, for example. You also can’t install any extensions yet, either (though Vivaldi already has the hooks for that built in and will enable them in one of the next previews). In the long run, Vivaldi will also include a built-in mail client. That seems like a throwback to an earlier generation of browsers, but it’s something Opera long included in its browser and that, according to Tetzchner, is something he always liked to have in a browser himself. “I don’t think webmail is for everyone,” he told me. “It’s definitely not for the advanced user. We find that lots of users have multiple mail accounts and they don’t tie together and when you have the mail client built into the browser, it feels more natural.” Vivaldi will soon offer its users a Vilvaldi.net email address, but the mail client will work with any email account. Vivaldi currently has about 25 employees and von Tetzchner is self-funding the project for now. In the long run, he plans to monetize through search deals and potentially through affiliate deals, too, though he noted that this is something the company still has to figure out.